This blurb is from the authors’ website here. Many a romance reader got their start from Harlequin or Mills and Boon categories. Some readers stick with those, some venture off to other romance subgenres and leave categories behind, while yet others continue to keep the categories as faithful auto-buys while they enjoy other subgenres as well. Ilona Andrews has taken some of the common category tropes and used them in the Kinsmen universe. It is a universe with a select percentage of inhabitants who have genetic mutations providing different mental and physical skills or powers. These mutations initially started with purposeful genetic modifications that were later outlawed as the enhanced discovered that these enhancements would have more value and thus power if they were limited in number. As a result further modifications were outlawed and those with enhancements formed family groups almost like the mafia where loyalty was paramount. In SILVER SHARK which is the second of the Kinsmen series following 2009’s SILENT BLADE we travel to Rada in the company of a refuge and explore the wealthy multi-millionaire and his secretary (administrative assistant) trope. Here the Kinsmen families follow very strict rules governing their interaction with other families as well as with those who do not have any enhancements. The reasoning behind those rules was an attempt to minimize the collateral damage as a result of the constant maneuverings for more power that sometimes flared into violence between the families. Unlike traditional categories, with an extreme power imbalance between the multi-millionaire and his (always his) secretary/administrative assistant, in this one the heroine possesses a significant amount of power herself but exposing that power could very well mean her quick and rather unpleasant death. The hero is also powerful and has sacrificed much for his family yet he doesn’t consider the unenhanced beneath his notice. I enjoyed learning about Rada thru Claire’s mind as she struggled to transition from a regimented, colorless, flavorless life to that of a civilian on a world with freedom, choices and color. Her interactions with the Escana family and Venturo in specific were very entertaining as was her decision to explore and experience what we would consider normal life. Claire also had to deal with some fellow refugees and the fact that they knew who she was and what she could really do as she attempted to “blend.” The situations caused by those encounters really served to flesh Claire out as a character. 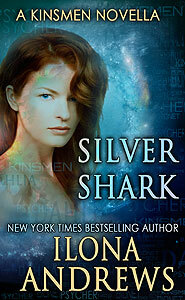 I really enjoyed reading SILVER SHARK and thought it ended way too soon. The story was complete, I just wanted more *grin*. I really appreciate the way Ilona Andrews sprinkles in information about the world instead of doing info-dumps. That technique always leads me deeper and deeper into the story as I watch the entire picture unfold in my mind’s eye. I hope that more Kinsmen stories are published and I am curious to see which trope(s) will be targeted next. Great review – I agree completely. Love the twist on the boss/secretary romance trope and I would not mind seeing more from Ilona Andrews where they riff off a trope like this. And I’m also with you on the ending.. just a leeetle bit more, especially on what Venturo’s thinking would have made me happy, but it was still a complete story. It was a lot of fun to read. My sister and I had a wonderful gossip fest about this and Silent Blade yesterday.